StitchyDonDesigns: Christmas in September !! It's early but I wanted something to work on whilst working on my owl and a secret project I can show in a couple of days. I picked out one of my projects from CJC 2013, a simple cute but sparkly christmas pattern. 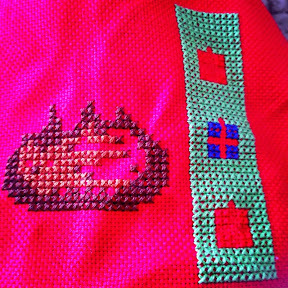 It's a really old freebie from Crosstitcher website that I can't find online now. I'm very close to a finish. That's one of the reasons that I picked it up: I really need a finish I think to pick up my stitching mojo !!! I am enjoying thus, even if it contains the dreaded dmc metallics !!! Nice progress Donna. Love the colors on the red fabric. Just thought I would mention that your posts are hard to read with the background color and like color of the words. Thanks for letting me know, I've made some adjustments but let me know if it is still bad and I'll completely alter it. Cute stitch. Good luck with the finish. 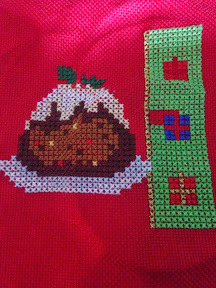 It looks lovely, it's never too soon to start Christmas stitching. I love the red fabric!